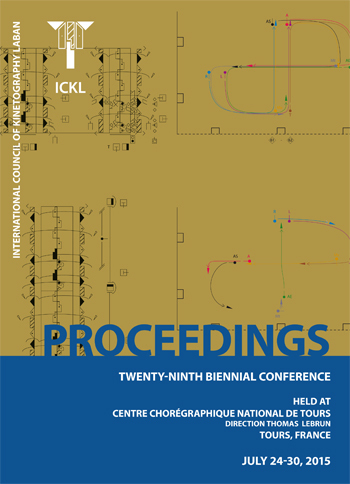 ICKL 29th Conference is under the patronage of UNESCO. “Lignes de choeur”. 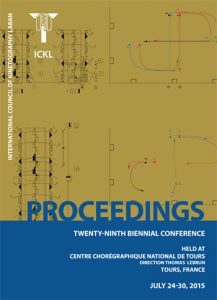 A publication after a one year residence at François Rabelais University – Tours, France. Understanding “Simultaneous Movement” as an analytic principle in movement notation and its usage in movement composition. All participants and presenters must pay the applicable registration fee and membership fee for 2015. The registration fees include 6 lunches on site, a mid-conference cultural outing at Château de Chenonceau and a closing dinner at Château d’Azay-le-Rideau. Payment can be done either in US check ($US) or online with PayPal (€). For questions regarding registration, please contact the Secretary (secretary@ickl.org) or Treasurer (treasurer@ickl.org) by e-mail. Cover illustration: Cover illustration: notation score of Lied Ballet, choreography Thomas Lebrun, 2014. Notation Raphaël Cottin, 2014-2016. © Centre chorégraphique national de Tours.